The nestbox at Central Terminal must be getting crowded because the kids are leaving the box 1-2 weeks earlier than expected! Last week one was on the ledge under the nestbox. All seemed quiet this morning with Stash and Stella on higher perches. A couple large eyasses were at the front of the box blocking the view of those behind them. 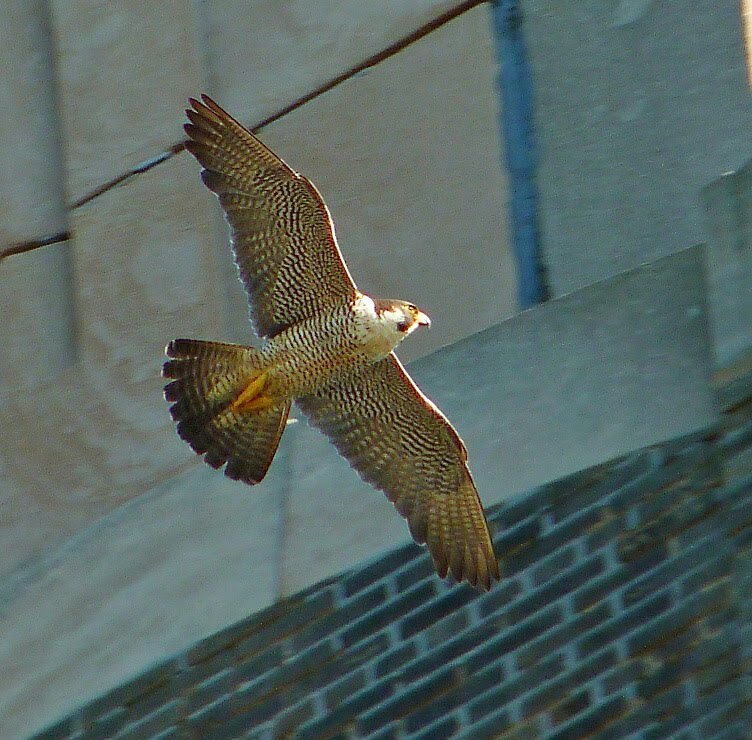 We returned about 6pm to see Stash and Stella flying around over the lower middle building and immediately saw why! Little Stash Jr. was crawling along the ledge quite a bit lower than the nest! We returned this evening to find two of the fledges on the same nestbox perch! Then we went to the other side to find the third, and I saw one fly by, but didn't know which bird it was. When we got around the tower there was just one pefa now on the perch, but another was eating prey atop Clark. We are assuming this one was one of the two from the perch, though it could be a third. No way to be positive without seeing all three at once. Then the other perched boy took off and wound up on the very top of MacKay Tower.